641 backers pledged $17,236 to help bring this project to life. As I write this, the fundraising project is just a couple hours from closing at thousands of dollars over the goal. A long road lies ahead, but the support we've received from all of you has us energized, excited, and most of all grateful. It's hard to put into words how thankful we are for your generous support the last few weeks. So, instead of trying to put it into words...I think we'll put it into the game. I can't think of a better way to give back than to try to make Lifeless Planet the experience you want it to be. And with your help, I believe this is possible! 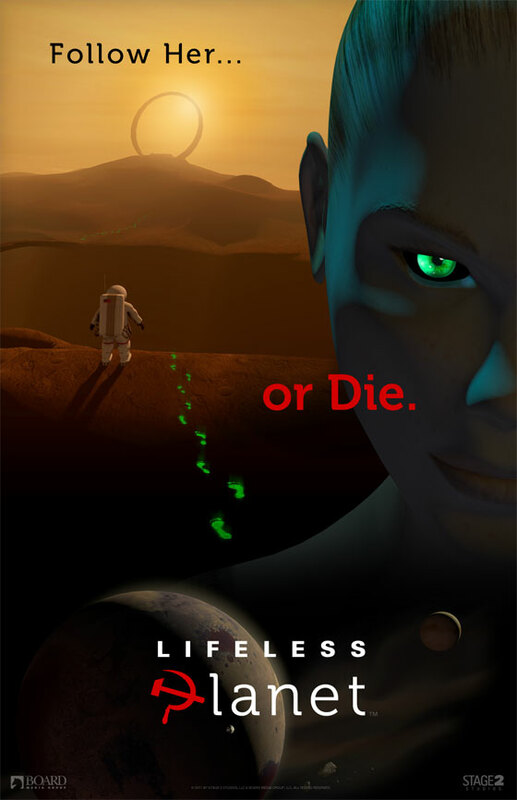 The goal of Lifeless Planet is to put the “adventure” back in "action-adventure.” I grew up loving games like Out of this World, The Dig, and ICO, and I want to create a gaming experience in the spirit of those classic adventure games. In the last few years, scientists have actually discovered over 1,000 new planets outside our solar system, and a few of those may be similar to earth. In Lifeless Planet, you’ll get to explore one of those distant worlds. But you’ll quickly discover the planet is a barren wasteland. Mysteriously you’ll also find evidence that other explorers had already set foot on the planet...many years ago...and you’ll struggle to explain the existence of another human in this desolate place. Will you be able to put aside your skepticism and follow her to preserve your life? I don’t want to spoil the story so I’ll leave it there, but I think you’ll discover I’ve worked long hours to write a plot that will present something new and exciting. It takes a massive effort to produce a quality game—especially for an independent game developer like Stage 2. My hope is to finish and release Lifeless Planet in under a year. I’ve already made great progress, as you can hopefully see from the trailer. But I need your help to secure the time and resources needed to finish this game. Your contribution will enable me pay for development resources and will help purchase much needed hardware and software. If we surpass my funding goal, the extra money will help me port the game to more platforms including iOS, Android, and hopefully the XBOX Live Arcade. You can support my project with as little as $1, and you can actually pre-order the game for only $10! NOTE: We expect to deliver most rewards except the game itself by the end of the year. 6 Inch Tall Figurine. This item will be printed on-demand using 3D printing technology. This is a breakthrough process where the model is actually created layer-upon-layer by a specialized machine using the original computer model itself as the guide. It's like ink-jet or laser printing, but in 3D! Because this process is digital, the model will have a sandy, granular surface on close inspection. However, the resolution is greater than the iPhone 4's "retina display" and the final model is sprayed with a special UV coating to give it a smooth and more durable finish. We've just added a new $60 Reward level with a brand new White T-shirt featuring the Aelita portal image. Check it out! You also get all the previous rewards at this level...including the 11x17 in. signed poster! As the Lifeless Planet Kickstarter project cruises to the finish line, I feel it's time for me to give back. Because you've been so generous with your support, we now have the resources to make Lifeless Planet even better than originally planned. One extra component we've decided to create is an exclusive digital comic. This short story will provide additional backstory to the game and shed light on the fate of the missing crew members. This is a free bonus reward for all backers at the $25 level and up! PLUS: If you originally pledged less than $25, you can still increase your pledge to $25 (or more) and receive all of the additional rewards including the new digital comic. If you've already pledged $25 or more, you don't need to do anything--you'll automatically receive the digital comic when it's done. Now remember, Kickstarter projects are all-or-nothing. This means your pledge will only go through if we meet the funding goal. However, it also means that I need your help even more, because if we don’t reach that goal, I get nothing, and the project doesn’t go forward...so please make a donation and share the link with your friends and family. Exclusive HD Desktop Background Image and your name in the credits as a Supporter. Digital Pre-Order of the Game (for PC or Mac). This is a significant savings over the expected retail price of the game! PLUS: The HD desktop image and your name in the credits as a Supporter. Beta-Testing Invitation. Be a part of the project and help craft the game with your feedback. PLUS: A digital pre-order of the game, the HD desktop image, and your name in the credits as a Premier Supporter. Full-Color Poster (11x17 in.) signed by the creator. PLUS: A beta-testing invitation, a digital pre-order of the game, the HD desktop image, and your name in the credits as a Premier Supporter. 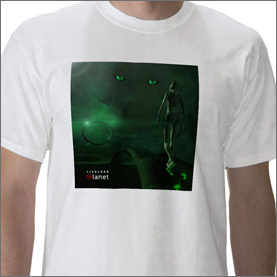 White T-Shirt Featuring “Aelita,” the mysterious young woman you will encounter in the game. PLUS: Full-Color Poster (11x17 in.) signed by the creator, a beta-testing invitation, a digital pre-order of the game, the HD desktop image, and your name in the credits as a Premier Supporter. Huge (2x3 feet!) Full-Color Poster. PLUS: A beta-testing invitation, a digital pre-order of the game, the 11x17 in. poster signed by the creator, the HD desktop image, and your name in the credits as a Premier Supporter. Black T-Shirt Featuring “Aelita,” the mysterious young woman you will encounter in the game. PLUS: A beta-testing invitation, a digital pre-order of the game, the 11x17 in. poster signed by the creator, the HD desktop image, and your name in the credits as a Funder. 6 in. Tall “Aelita” Figurine. This is a full-color resin model 3D-printed from the actual digital model of the mysterious young woman you will encounter in the game. PLUS: A beta-testing invitation, a digital pre-order of the game, the T-Shirt, the 11x17 in. poster signed by the creator, the HD desktop image, and your name in the credits as a Funder. In-Game Ad or Easter Egg. We will work with you to create a custom texture with your message—either something commercial or just for fun—that will appear in the final game. (Content is subject to our approval.) PLUS: A beta-testing invitation, a digital pre-order of the game, the T-Shirt, the 11x17 in. poster signed by the creator, the HD desktop image, and your name in the credits as an Official Sponsor. Associate Producer Status. Your name in the main titles as an “Associate Producer,” and we will actually consult with you on the game production (via email and conference calls). While we will reserve the right to veto suggestions, we will seriously consider your input. This is a great chance for you to improve your resume if you are a student in the games or visual effects industry. PLUS: A beta-testing invitation, a digital pre-order of the game, the T-Shirt, the 11x17 in. poster signed by the creator, and the HD desktop image.